This article will show you how you can create a responsive jquery datetime picker calendar with plush & minus date changer in asp.net. In this calendar date and time change will take place by plush and minus sign. Some of my previous articles are as follows: Dynamic Thumbnails Image Preview Slider With Zoom Effect Using jQuery In Asp.Net and C#.Net, Sign Up Form For Newsletter In Asp.Net Using C# and Css3, Facebook Style Lightbox jQuery Plugin To Display Images Like Facebook In Asp.Net, Webcam Integration Using jQuery Webcam Plugin In Asp.Net, Asp.Net Dynamic jQuery Photo Gallery Plugin With Zoom Effect Using Css, Three Level Menus With Disable Menu Item Using jQuery In Asp.Net. So for this article first we will create a new asp.net application and add the below library refrance into the header of the page. Now add the below jquery code to the header of the page. 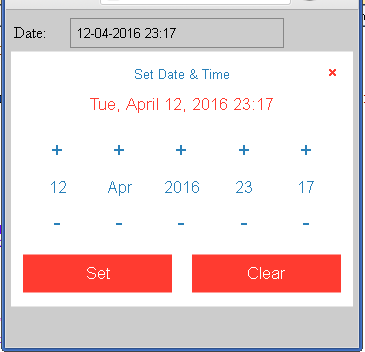 In above code I have shown the calendar on the click on textbox. So here is the complete code.